ISLAMABAD: Adviser to the prime minister on parliamentary affairs Babar Awan Tuesday resigned from his post on Tuesday, hours after the National Accountability Bureau (NAB) filed corruption reference against him. 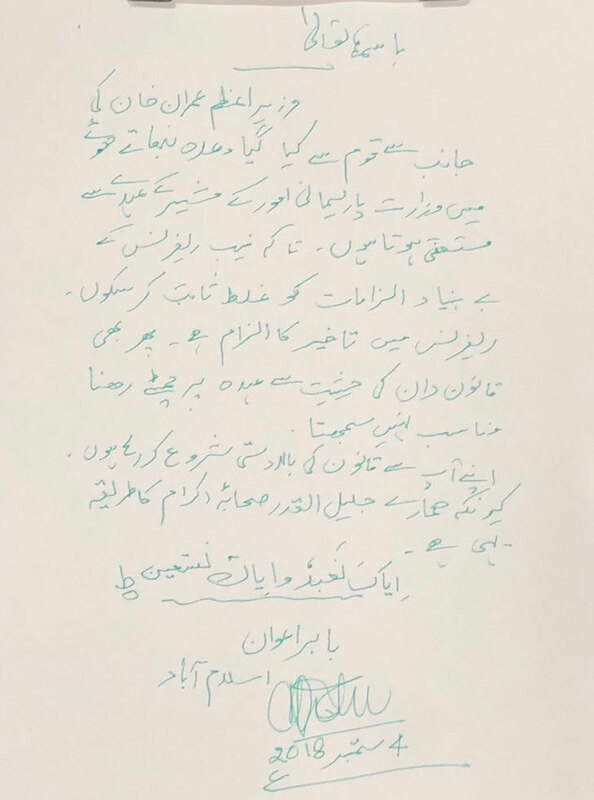 "I resign from the post of adviser to PM on parliamentary affairs, so that I may disprove allegations levelled [against me] in the NAB reference," read a copy of Awan's resignation letter. "Just reached PM House to tender my resignation from Ministry of Parliamentary Affairs," Awan wrote in a tweet. "Rule of Law begins with me. Thank you, Insafians for standing by me always. I will never let you down." The resignation came hours after the NAB filed a corruption reference against Babar Awan regarding a delay in Nandipur Project in Accountability Courts Islamabad. The delay was caused during the tenure of Pakistan Peoples Party-led government in the centre from 2008 to 2013, with Awan then serving as minister for law and justice. Earlier in the day, Awan wrote in a tweet: "Requested NAB several times to grant me my right to defend myself against false allegations. I was never given that chance since Day1 proceedings were one-sided. "I was not called in the inquiry or investigation phase. Now I shall use all legal options at my disposal InshaAllah," he added. The prime minister has paid a tribute to Awan for his services for the party, said Iftikhar Durrani, special assistant to PM Khan. He said the premier also appreciated Awan's decision to dissociate himself from the public post. Durrani said that Awan would again take charge as PM's adviser after completion of NAB investigations, however, until then he would remain away from the office. Former federal minister for water and power Raja Pervaiz Ashraf, along with other officers of the ministry, also faces a corruption reference for delay in the same project.